Remove front side door trim panel. 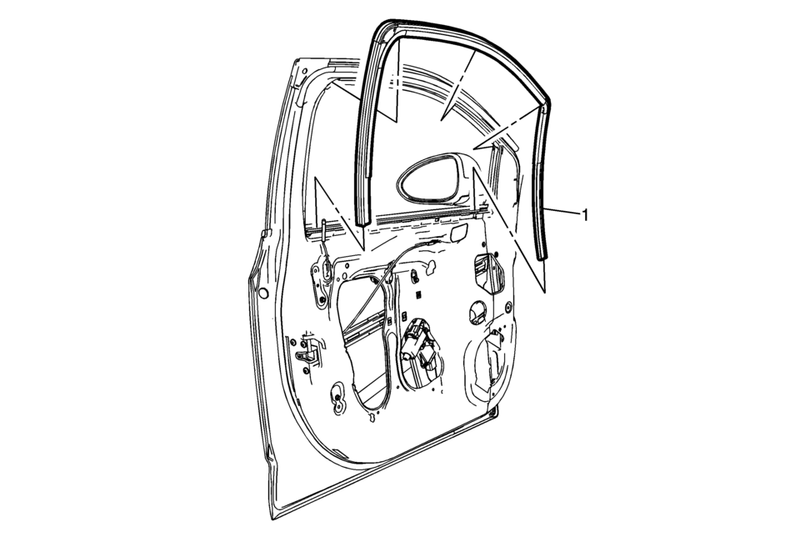 Refer to Front Side Door Trim Replacement. Remove the outside rearview mirror. Refer to Outside Rearview Mirror Replacement. Place the window in the fully down position. Grasp both upper corners of the window weatherstrip, pull downward releasing the assembly from the door frame. Insert the weatherstrip downward in the front and rear channel until fully seated. Position the window weatherstrip in the upper rear corner of the frame, work the weatherstrip around the door frame. Carefully move the regulator upward for short slow intervals, while ensuring that the window remains in the channels.